465 in stock Need More ? 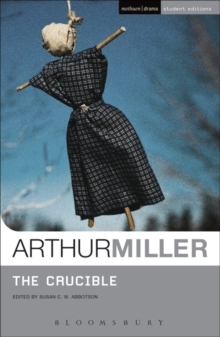 This Student Edition of The Crucible is perfect for students of literature and drama and offers an unrivalled guide to Miller's classic play. It features an extensive introduction by Susan C. W. Abbotson which includes: a chronology of Miller's life and times; a summary of the plot and commentary on the characters, themes, language, context and production history of the play. Together with over twenty questions for further study, detailed notes on words and phrases from the text and the additional scene 2 of the second Act, this is the definitive edition of the play. In a small tight-knit community gossip and rumour spread like wildfire inflaming personal grievances until no-one is safe from accusation and vengeance. The Crucible is Miller's classic dramatisation of the witch-hunt and trials that besieged the Puritan community of Salem in 1692. Seen as a chilling parallel to the McCarthyism and repressive culture of fear that gripped America in the 1950s, the play's timeless relevance and appeal remains as strong as when the play opened on Broadway in 1953.